In one of the most anticipated clashes of the Europa League Round of 32, Maurizio Sarri’s sensational Napoli side took on Ralph Hassenhuttl’s RB Leipzig following a 3-1 defeat in Naples. Leipzig came back from a goal down at halftime to score three in the second half and basically put the 2nd leg tie out of reach for the Neapolitans. With Napoli increasingly focused on winning their first Scudetto since 1990, the return game in Leipzig was of little importance to the players and Sarri even admitted prior to the 1st leg that he’d a hard time motivating them for this fixture. Nevertheless, they played with focus and defended well, which allowed them to restrict Leipzig’s electrifying counter-attacking game. At the end of the night they ran out 2-0 winners but Leipzig went through to the Round of 16 because of the away goals rule. Napoli were the dominant team in terms of possession throughout the match and so it was key for Leipzig to find solutions to their fluid build-up and penetration. They defended in their usual 4-4-2 mid-block and used a space-oriented man-marking system. In this system, the players focused on defending the spaces in midfield but immediately closed down players who received the ball inside the block. In relation to Napoli’s build-up, this prevented their midfield three (Diawara, Allan and Hamsik as well as Mertens who often finds himself in deeper areas) from combining straight down the centre. At the start of their build-up their centre-backs sought to play vertical passes into one of the three, who were all positioned in behind Youssef Poulsen and Timo Werner, the two Leipzig forwards. This didn’t work for two reasons. One, Leipzig’s mid-block was very compact making it hard for the ball to be played into these players. Secondly, whenever the ball was played into Hamsik or Allan with their back to goal, they would lay the ball off to Diawara who normally had a better view(facing forward from his deep-lying position). The problem was that he was prone to backwards pressing from his blindside when he received the ball because of how close he was to Werner and Poulsen. 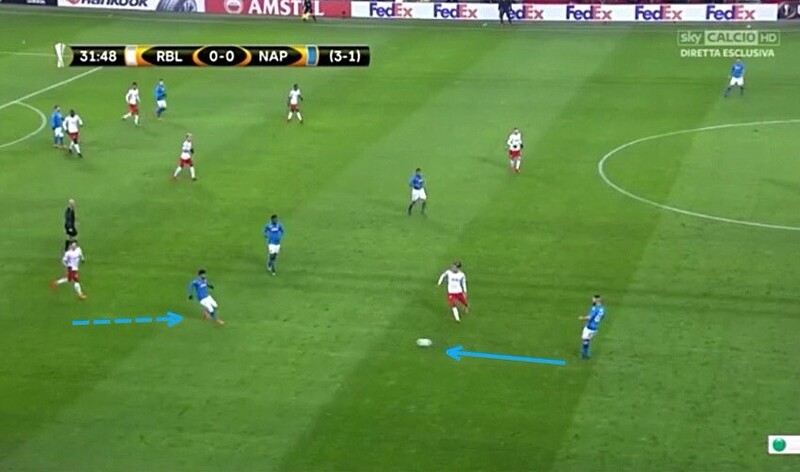 Napoli’s solution to these problems was to use their fullbacks Mario Rui and Christian Maggio during the build-up in order to play around Leipzig’s compact mid-block. Mario Rui often received the ball near the halfway line, inviting pressure from Marcel Sabitzer, Leipzig’s right winger. This would create space in behind him which Rui would play the ball into, especially when Sabitzer pressed him at a poor angle. 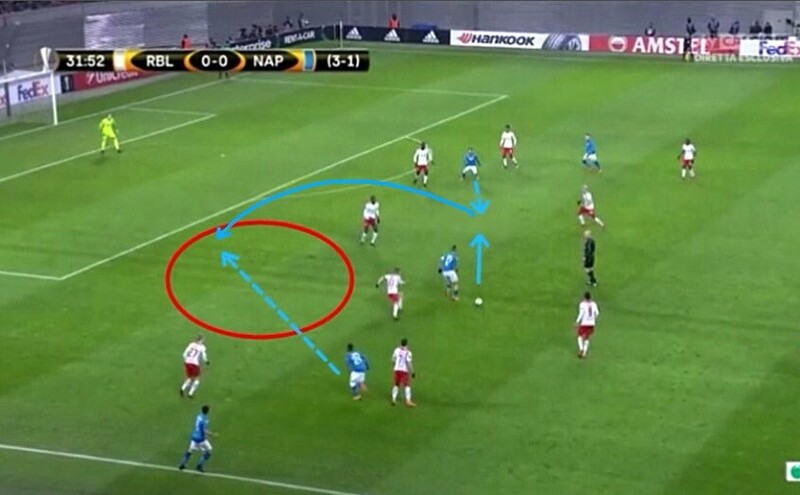 Napoli tended to use their left flank going forward because of the space they were afforded. They were also without Naby Keita, one of their most important players, and without him, they were certainly lacking in that area. It’s possible that Sarri targeted the left flank as one to exploit beforehand, because of Keita’s absence. With Rui and Maggio they bypassed Leipzig’s forward line and got into advanced zones on numerous occasions throughout the match. It was in these zones that Leipzig’s defensive issues were further exacerbated by the visitors’ excellent movement. Against a side as flexible as Napoli in possession, man-orientations can leave a side vulnerable to being pulled apart by rotational movements and quick passing. Marek Hamsik’s movement, in particular, was key to creating space in the centre of the field. 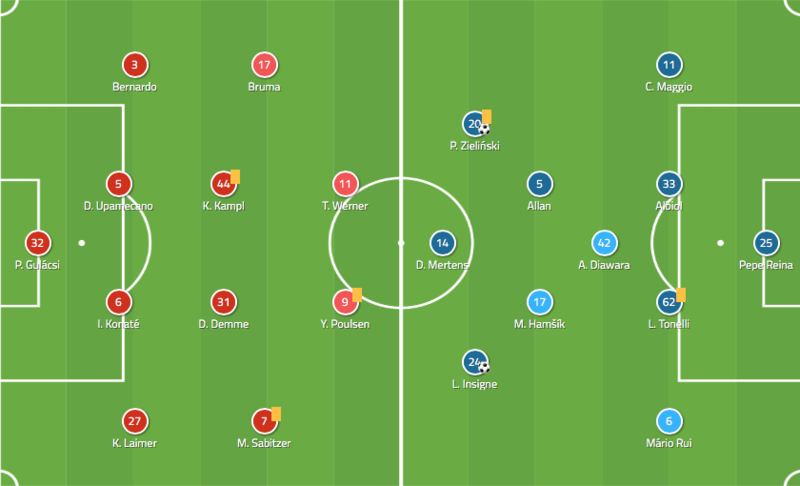 In fact, one of his runs in the 31st minute completely dragged Diego Demme out of position and Napoli used the open space in midfield to get in behind Leipzig’s backline. Below, Insigne drops into the space left vacant by Hamsik to collect the ball from Tonelli. Hamsik (man-marked by Demme) makes a move back into midfield. Insigne drifts towards the wing with the ball, drawing the right-winger Sabitzer with him, creating an even larger gap for Hamsik to run into. Dries Mertens drops just in front of the defensive line to receive a pass from Hamsik. His first touch was a brilliant over-the-top ball for Insigne to run onto. Insigne took a shot from inside the box and Piotr Zielinski followed up on the rebound to put the visitors ahead. 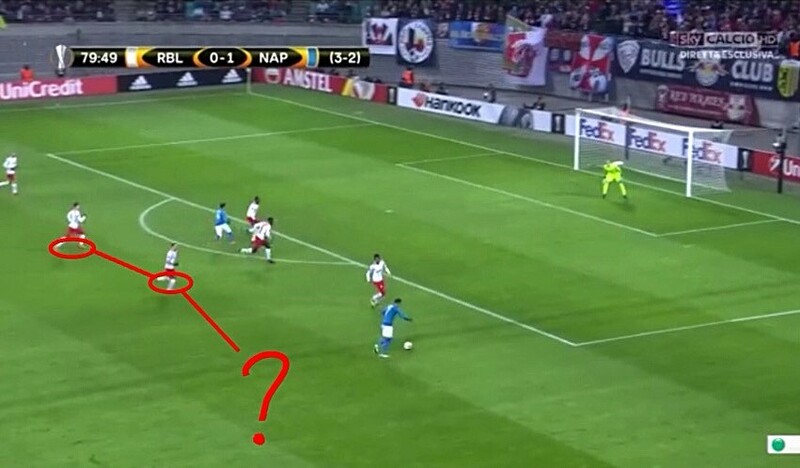 Had Napoli avoided being caught offside so many times they could’ve added a few more goals to the scoreline. Luckily for them, they went into the halftime break firmly in control of the game. The hosts only managed 42% possession throughout the game and one of the main reasons for this was Napoli’s excellent counter-pressing. Obviously, their close combination play allowed them to be in a good position once they lost the ball but Leipzig were also below-par when it came to their attacking transition. One of the main features of their game is their ability to break forward upon regaining the ball. However, they failed to play the crucial first pass(es) forward allowing Napoli to recuperate and settle into their defensive shape. 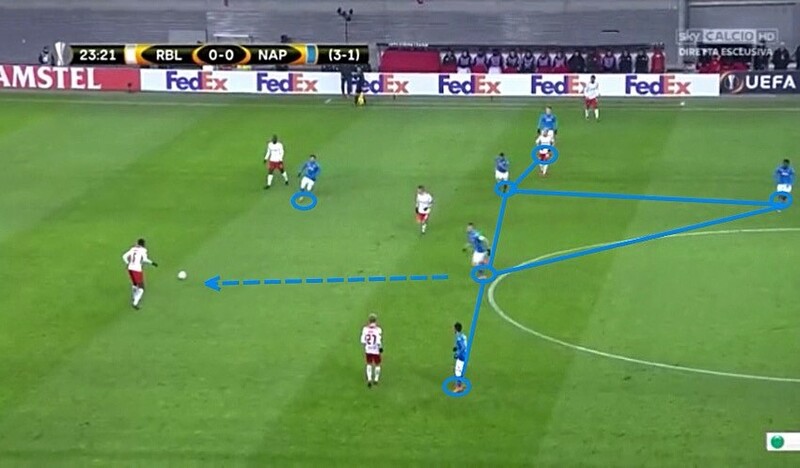 Napoli’s 4-5-1/4-1-4-1 shape. Their 5-man midfield provided coverage in all vertical zones across the pitch in advanced areas(left and right wing, left and right half space, centre). 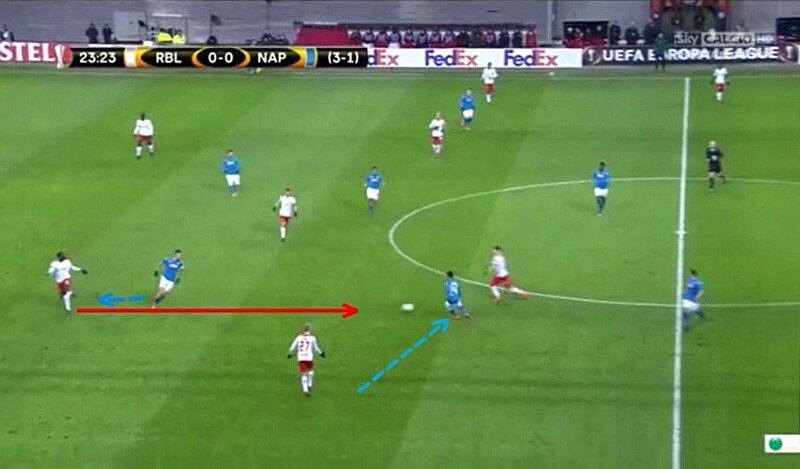 Here, Napoli have access to the ball and Hamsik leaves his position to press Upamecano. Upamecano plays a pass in behind Hamsik but Inisgne anticipates it and intercepts the ball. Although Napoli’s defensive system was similar to Leipzig’s, they had an extra man in midfield that prevented Leipzig from finding space, especially in central areas. Leipzig tried to play through their press on several occasions but it resulted in constant turnovers and limited time on the ball. When they did manage to hold on to possession they used long balls into Poulsen as a way of progressing up the pitch. Poulsen’s strength as a target man not only helped them bypass Napoli’s high pressure but it allowed them to immediately get into advanced areas, provided they could win the second or third ball. Once they were in these advanced areas, they would play the ball out wide and from there they tried to find gaps inside the half space. Napoli dominated the central areas as mentioned above but their wide players had a tendency of getting dragged towards the touchline while defending in deeper areas. Leipzig’s wide players exploited these ‘inner’ spaces with well-timed passes into their teammates positioned in the half-space, before getting crosses into the box. Unfortunately, the quality of their crosses was poor and they wasted many good opportunities from such promising positions. For the first 20 minutes of the second half, this approach worked to good effect but their inability to make the most of their chances put them back on the backfoot. With less than 30 minutes to go and in need of some fresh legs in key positions, Sarri made two substitutions. Jose Callejon came on for Hamsik in the 65th minute and Mario Rui was replaced by Elseid Hysaj in the 68th minute. Zielinski moved into Hamsik’s position and Callejon moved into Zielinski’s at wide right giving them full width down that flank. As the game wore on, Napoli managed to settle in possession and Callejon played an important part in receiving cross-field passes from the left side of the field which stretched Leipzig’s defensive structure. Hysaj, who played at left back, made sure that a tiring Sabitzer could no longer influence the game from near the touchline, effectively eliminating one of Leipzig’s key attacking players. In the 74th minute, an exhausted Bruma was taken off to make way for Emile Forsberg the Swedish playmaker. This substitution was a strange one by Hassenhuttl, considering the fact that he introduced an attack-minded player while they were trying close out the game. Forsberg was often caught out of position by the long switches of play from Napoli, allowing Callejon more time and space on the ball to not only stretch the defence but also to whip crosses in from the right. Mertens plays a ball out wide to Callejon, who has plenty of space around him. Forsberg is completely out of position. Callejon is left 1 on 1 with Bernardo giving him the opportunity to take him on or get a cross in. He chose the latter. Notice how Emile Forsberg is not even in the picture. He is so far ahead that he can’t even help out in this situation. 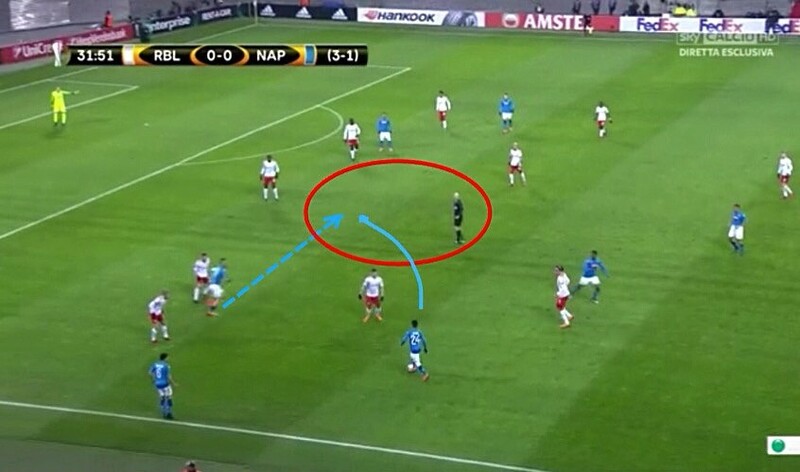 In the 85th minute, Leipzig’s poor marking was exposed yet again and Napoli scored their second goal. After a long ball into Poulsen, they failed to win the second ball and Napoli wasted no time in going forward after they’d regained possession. Leipzig’s midfielders all got dragged towards Allan who was carrying the ball forward and the Brazilian dribbled through all of them. He then played a through ball to Callejon and the winger put in an inch-perfect cross for Insigne to run onto. Insigne got in front of his marker in the box to put the visitors two goals up, ending a superb move by the visitors Under huge pressure, the hosts spent the remainder of the match clearing the ball out of their half, forcing Napoli to restart their attacks from deep over and over again. Hassenhuttl looked incredibly nervous on the touchline but this method worked and they managed to close out the game. The 2nd leg tie was played brilliantly by Napoli who adapted well to their German counterparts. They’ve generally struggled to adapt in European competitions this season and this was not helped by the fact that their focus has been on winning the Scudetto. However, even though they started without several key players, they were fluid in attack and defended intelligently too. Leipzig, on the other hand, showed little quality to match the visitors in a fixture that was a lot more significant for them. They were easily pulled apart by Napoli’s clever rotations and ultra-sharp passing and wasted chances whenever they got into good positions themselves. Luckily for them, they held on for an important victory to progress into the Europa League Round of 16.